The titans growth could be slowing. Mondays reading was 42 inches (107 cm) and todays is 43.5 inches (111 cm). Although we measured 1 hour earlier than normal, maybe it would have put on another half inch in that final hour? Doubtful. The spathe continues to show more color throughout. 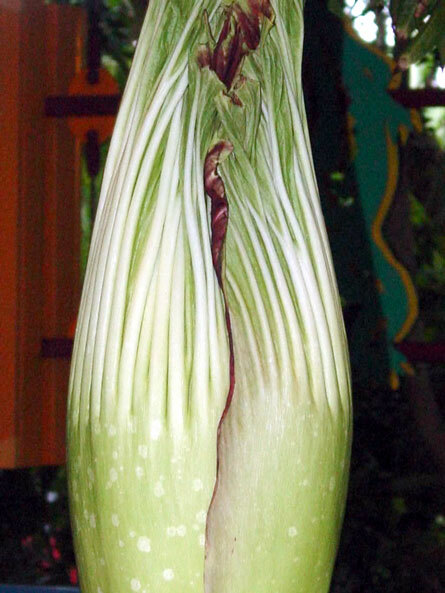 The spathe also appears to be more loosely arranged around the spadix, which has some of us a bit nervous that this thing may be getting close to opening. Even this far removed from the path of Hurricane Katrina, we were not immune to its effect and on Friday night we had a squall blow through that toppled our leaf. We had a beautiful example of a mature titan leaf in our display and our Saturday morning crew arrived to find it had shifted in the pot and was leaning sideways. We were able to salvage the plant and it was returned to its greenhouse where it had to be most creatively supported while it regenerates its roots. 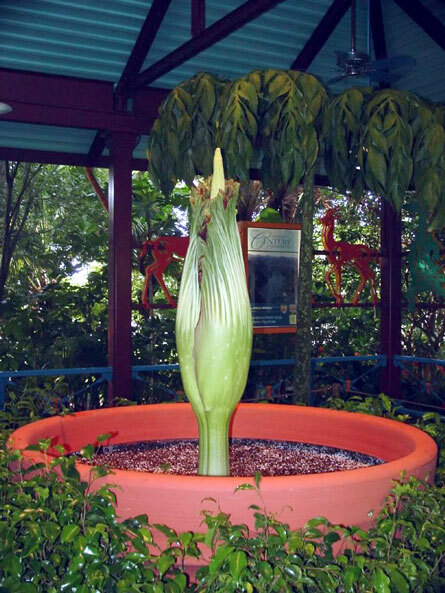 Since our third titan is just coming out of its dormancy, we had no other titan leaves to replace it with, so we are displaying some examples of Amorphophallus gigas in the display. It has come to our attention that some of our facts werent entirely correct. 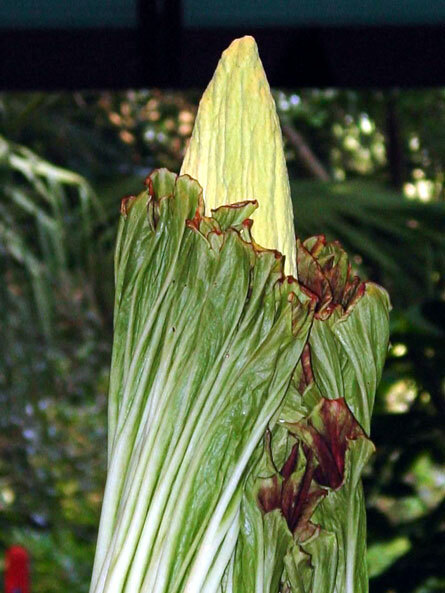 First, the tallest cultivated titan bloom on record is 124.8 inches (317 cm) tall and occurred at the Cibodas Botanic Garden in Java. Secondly, in the first update I referred to our tuber being 38 pounds (17 kg) shy of the world record when I was comparing to the flower. Im not sure what the world record is for titan tubers but there are larger tubers out there. 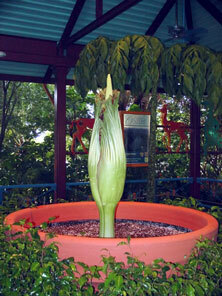 Most recently, Kew Gardens repotted a titan with a 200 pounds (90 kg) tuber weight and the Bogor Botanic Gardens in Java have a 200 pounder. Thanks go out to Mike Miller for bringing this information to my attention. Spathe loosely wrapped around the spadix. Maroon colorations becoming more evident.